When you hear the phrase “data security risk,” what comes to mind? Probably not your office copier, but the reality is copiers retain a significant amount of sensitive information. Every time an employee scans a W2, driver’s license, or other identifiable paperwork, the copier saves it. Laser Line, Maryland and D.C.’s top choice for printer services, is here with a helpful guide to securing that data so that your company doesn’t have to deal with the damage of a data breach. Before you can start the process of securing data, you need to know your copier’s capabilities. Consult the user guide to verify what, if any, information is held on the copier’s hard drive. Find out if your copier has any safeguards already in place for deleting information after a certain period of time, or if it has supplemental features that you can add to the copier for more security. The first line of defense for office copier data security starts with the employees. Many people simply aren’t aware that copiers retain information, so they’re more likely to scan sensitive or confidential information without pause. Obviously, some papers need to be copied or scanned, so make sure that all employees know the proper procedure for erasing data from the copier after use. If you’re upgrading or returning office copiers, don’t just ship them off to the printer services company as is. Unless the company offers services for data disposal, it’s important that you ensure that there is no sensitive information on the copiers before they leave your possession. Either remove the hard drive entirely, or, if it’s a leased unit, completely erase all data on the unit and document the process for compliance purposes. Protect your business from an office copier data breach by following the steps outlined above. 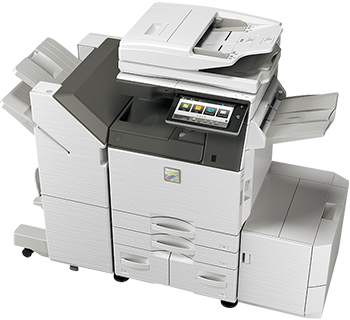 To learn more about the capabilities of office copiers or Laser Line’s printer services, visit their website or call (410) 636-1700 today.